This Thursday night, we'll not be trick or treating round our local neighbourhood, instead we'll be at Church, more specifically in the car park participating in a Trunk or Treat. We're actually quite excited about it. I'm excited because I know that the Children will be with friends and able to walk around the various cars of my friends in relative safety and with the added benefit of not having to have their Mum trudge around with them as apparently I'm uncool. I'm excited about seeing the children that I see in my Church Primary Class in a social setting too, mainly so that they can see that I am actually as weird as they think I am. 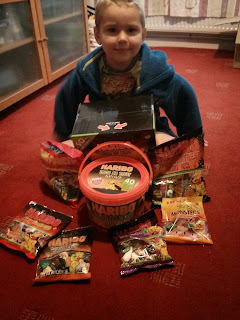 I'm also quite excited as Haribo have sent us a selection of their rather yummy sweets to give out on Halloween although I'm not that sure that Big Boy is going to be able to restrain himself from eating them all by then! Haribo have sent us the new Trick or Treat Box, featuring 50 mini bags of Horror Mix, the Trick or Treat bucket containing 40 mini-bags of Halloween themed goodies, scary games, petrifying glow-in-the-dark stickers and invites and several 200g sharing bags of Fangtastics. Big Boy was thrilled with the selections especially as the Postman came before breakfast and Big Boy thought this was the perfect excuse for him to test the various treats ahead of Halloween! This is where I need your help a little though. What shall I dress my car up as? I was planning on going simple and making a mouth for the boot/trunk but after looking on Pinterest I think that I need to go bigger! Any suggestions? As stated, Haribo sent me some Haribo. I've added it to my collection of Haribo in the kitchen!